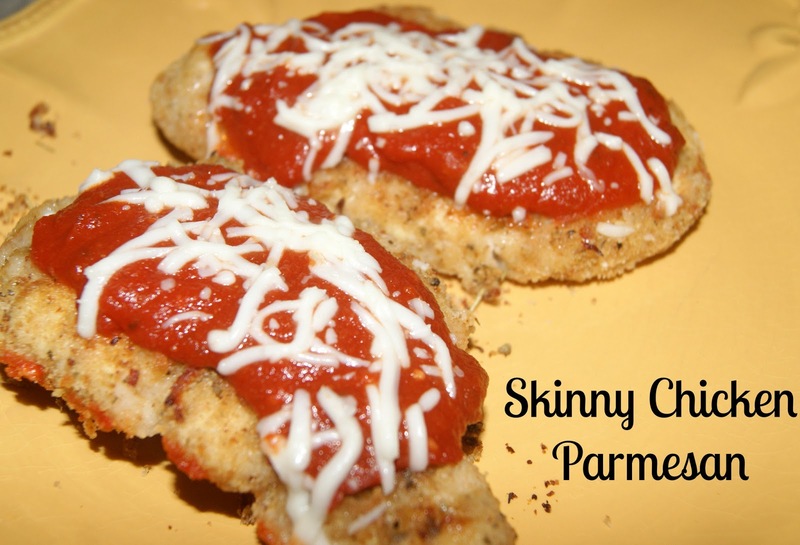 Chicken Parmesan can be delicious, but it can also be 1,000 calories per plate. I wanted to find a recipe that is yummy but that also doesn't make me feel like Humpty Dumpty after eating it. After browsing several recipes from Pinterest and pulling a little from each one, I came up with this little dish. It's an easy weeknight meal, and most of the ingredients are already in your cabinets. The best part? Each piece of chicken is only about 225 calories, hence the "skinny". Try it! 1. Preheat oven to 450 degrees. Line a baking sheet with foil and lightly spray with cooking spray. 2. Mix breadcrumbs, Italian seasonings, garlic powder, and parmesan cheese in a small bowl. 3. Take your first piece of chicken and dip into melted butter, covering fully. Dip buttered chicken into breadcrumbs mixture, coating well. Place chicken on a foil-lined baking sheet. Repeat with remaining 3 pieces of chicken. 4. Lightly spray tops of chicken with cooking spray and bake for 20 minutes. 5. Remove chicken from oven and turn over. Spoon marinara sauce onto chicken and then sprinkle with mozzarella cheese. Bake an additional 5 minutes or until cheese is melted. Serve with pasta or a veggie for an easy weeknight meal! This looks so good! I love chicken parm! To make it even healthier, I don't use butter, I just wet the chicken enough to wear the breadcrumbs stick to it!